Thank you to Charly and Shirley for sending these cards from their trips to Costa Rica. This Central American Republic is known for its volcanoes and its rich bio-diversity, but you might not realise that it is a regular winner of the top spot on the Happy Planet Index. The Happy Planet Index is a method of combining different data sets to give an indication of how well different countries manage to achieve a sustainable long and happy life for their citizens. It’s not usually the wealthiest countries that do best. And a high ranking on the HPI does not mean that the country is perfect, nor that all of its people are happy. The Happy Planet Index is calculated using well-being data (from the World Gallup Poll), life expectancy, outcome inequality data and ecological footprint information. You can find out more about this fascinating concept at the Happy Planet Index site. Another reason for the good state of modern Costa Rica is more counter-intuitive though. This part of Latin America was much less exploited by Spanish colonial powers because it was fortunate enough not to have gold reserves. However, Costa Rica’s richness in bio-diversity also has its roots in geology. The formation of the whole isthmus ( a narrow strip of land which joins two larger land masses) of Central America began around 50 million years ago with volcanic activity at the margins of the North and South American, Caribbean, Nazca and Cocos tectonic plates. The land between the continents of North and South America began as an island arc of submarine volcanoes which built upwards and outwards until they broke the surface approximately 3 million years ago. Since then they have remained active, but now with rich volcanic soils. 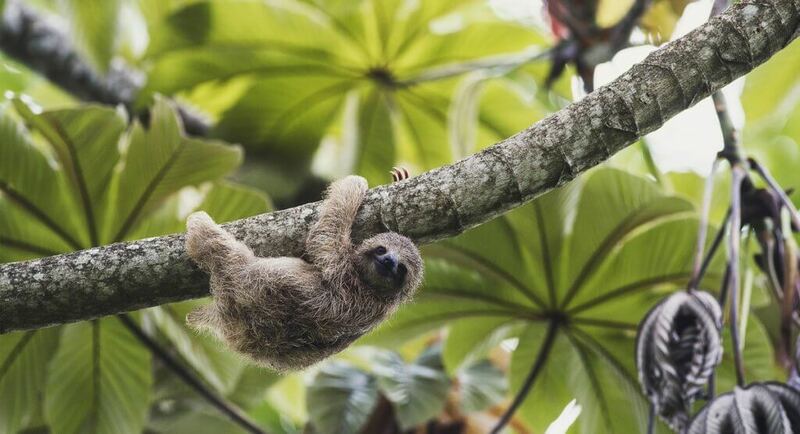 The location at ten degrees north of the Equator gives approximately 12 hours of sunlight every day and the warm tropical temperatures and ample rainfall have made the place very well suited to the growth of an incredibly diverse flora and fauna (plants and animals). An isthmus is a very important feature in bio-diversity because it allows species to cross overland from one land mass to another, and this gives them greater opportunity to survive. For example, in previous ice ages of the northern hemisphere animals would have been able to migrate incrementally south across the Central American isthmus, and in ice ages of the southern hemisphere they could could have shifted north. That was the case before human intervention, it is much less likely that any animal would be able to replicate that now, and the forests of Costa Rica are very vulnerable to variations in climate brought about by global climate change. For more information about bio-diversity in Costa Rica Geography Cat recommends you visit the World Wildlife Fund website.